Sweet Potato Pancakes. A different spin on potato. What are Sweet Potato Pancakes and what do you eat them with? Do you know that I live in Wisconsin? And, that Wisconsin has a huge tradition to go out for a fish fry every single Friday night? Don’t try to go out Friday night without a reservation. Or go really early. One of the main sides of a traditional Wisconsin fish fry is potato pancakes. Along with rye bread, potato salad, and baked beans. Friday night fish fry is not a low-calorie meal! 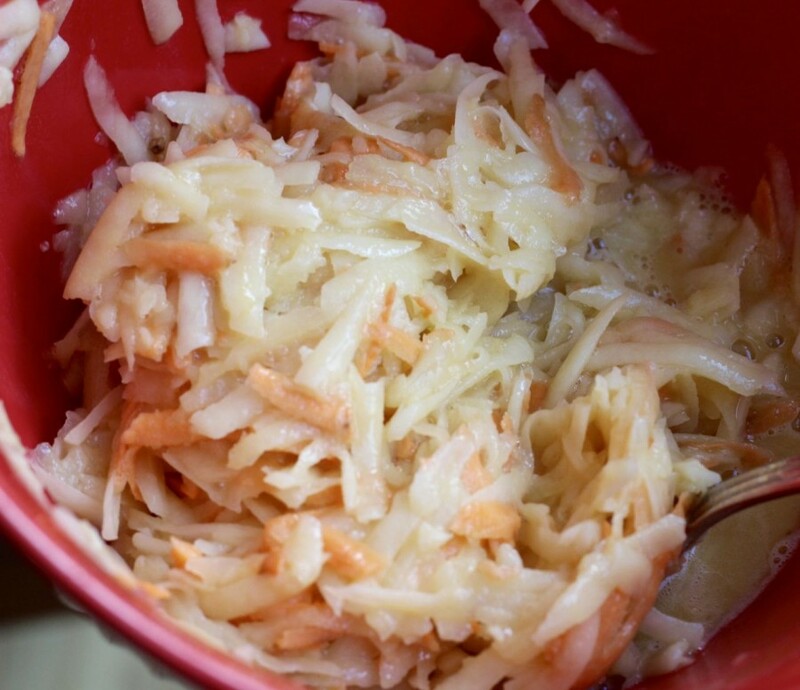 In this recipe, I’ve made the potato pancakes a little healthier by adding sweet potato. I’ve had potato pancakes a few times in restaurants and wasn’t too thrilled. Then, a couple of weeks ago I was out for coffee with a friend and, we were talking about some of the cheap foods we survived on in college. My friend was talking about how she had learned to make a mean potato pancake. Of course, I asked for the recipe. How did I not know these are so good? I’ve never made scratch potato pancakes. They aren’t hard to make and use very simple ingredients. The printable recipe is a little further down. But, let me take a minute to show you how they are made. How are sweet potato pancakes made? Peel and coarsely grate two russet potatoes. Use a clean but thin dishtowel and squeeze all the juice out of the potatoes. I added about a 1/4 cup of sweet potato (that I had patted dry with a paper towel). Just trying to make the potato pancakes a little healthier. Add three lightly beaten eggs, 1 1/2 TBSP flour, 1 TBSP flour, 1 TBSP finely grated onion and a bit of salt (1 1/4 tsp) to the potatoes. Heat 1/4 cup vegetable oil in a heavy skillet. Medium high heat. Make sure the oil is nice and hot when you add the potato mixture. Drop large spoonfuls of mixture into the hot oil, and spread with the back of the spoon until the potato pancake is approx. 1/4 inch thick. Fry until a nice golden brown on the bottom. Anywhere from 3 -5 minutes, depending on how hot your oil is. Flip and cook the second side until brown and crisp. About another 3-5 minutes. Some sour cream is wonderful with these. I know some people like serving potato pancakes with applesauce. And, I have heard Worcestershire sauce is also good, although I haven’t tried that myself. Of course, I tried these. I couldn’t tell you how wonderful they are unless I did, now could I? Well, instead of a little taste, I ate the whole sweet potato pancake and had to stop myself from eating a second one. They are really, really delicious! Don’t tell my Wisconsin friends, but I’m not a fish fry gal. I will be making these potato pancakes as a side from now on. It’s the time of year where I get tired of my regular rotation of food so I love the idea of something different. My kids tried them and liked them too! 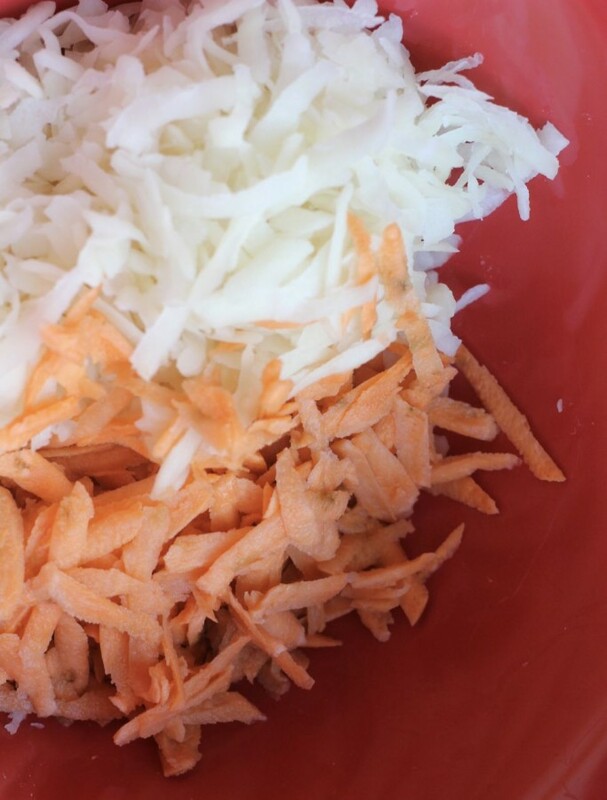 2 cups coarsely grated russet potatoes. Wrap grated russet potato in a clean tea towel and squeeze to remove as much moisture as possible. An older, thinner dishtowel works best. Dry grated sweet potato with a paper towel (I didn’t want to stain my tea towel). Add eggs, grated onion and salt to potatoes and mix in. Sprinkle flour over the mixture and mix into the potato mixture. Heat oil in heavy skillet – medium high. Drop heaping spoonfuls of potato mixture into pan. Using back of spoon, spread to about 1/4 inch thick. Fry for about 3-5 minutes, until golden brown on the bottom. Flip and fry other side to golden brown (3 – 5 minutes). Serve with either sour cream or apple sauce. I heard Worcestershire sauce is a good option too. Makes about 5-6 potato pancakes. Other potato recipes from my fellow bloggers. 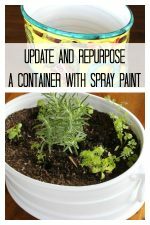 If you want some more interesting and creative potato ideas, take a look below! 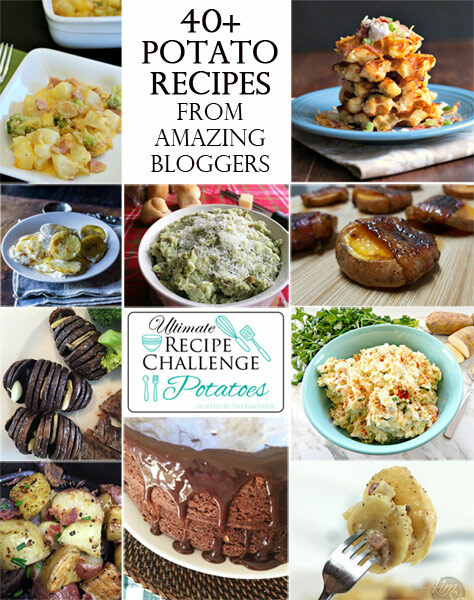 A group of bloggers accepted a challenge to make recipes using the potato. There are some wonderful, interesting recipes I know I’m going to try. Take a peek and see what you can find! « St. Patrick’s Day – 14 Recipe Ideas! These look delicious! 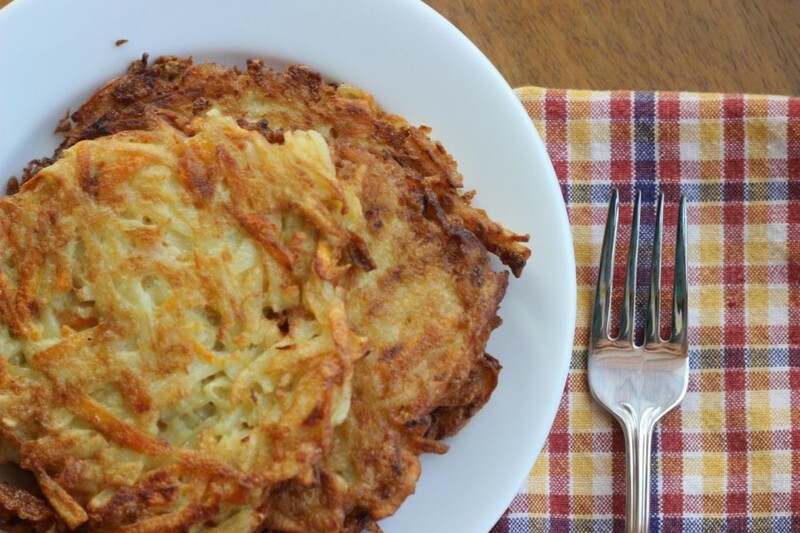 When I was growing up my Mom would make potato pancakes and they were one of my favorite dinners. I haven’t had them in ages. Thanks so much for sharing. I love potato pancakes so much. I can’t wait to try these out. They will be perfect, I just know it. I liked adding the sweet potato since they add some color and a little more nutrition. My kids won’t normally eat sweet potatoes but they eat them in the potato pancakes! Enjoy trying this recipe! It is easy to make, with no weird ingredients. 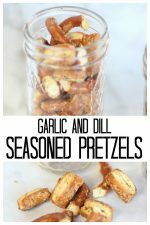 Not only did my family love these, but, they really are easy to make! Hope yours loves them too! I hope you like them as much as we do. It is nice to change up the menu at this time of year. But, like you, I can’t wait for grilling season. Soon, I hope!! Sometimes, it’s so hard to eat healthy. That’s why I sneak some healthier options into many of my recipes. Plus, I like the color of the sweet potato when you cut into the potato pancake. Thanks for visiting my site and for your comment! Hmmmm. My husband is a horseradish fan. Maybe I’ll try making the horseradish cream sauce for him. Thanks for stopping by! Be careful when you are taste testing these. I was taste testing them and ate two of them. Then I wasn’t hungry for dinner! 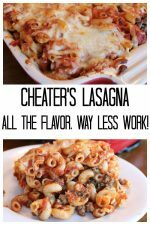 I love when I find a new recipe that everyone in the family loves! People have mentioned potato cakes to me recently. I will have to try them next time I have leftover mashed potatoes. I always hate throwing them away but no one in my house eats leftover mashed potatoes. But, I think they would eat the potato cakes! Thanks for being such a faithful reader of my blog! 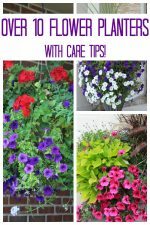 I read and appreciate every comment you make!! Thank you Teri! I tried this just before I wrote the post. And, now I’ve made them a couple of times since. Hope you enjoy them as much as my family does! 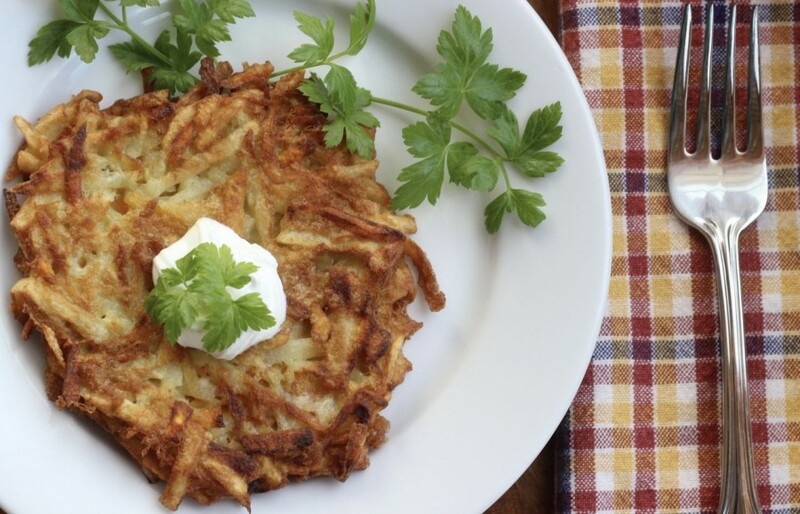 These look amazing, and potato pancakes are one of my favorites. Can’t wait to give these a try! We made something called potato cakes which I assume is a variant of these. It is made with left over mashed potatoes (leave overnight in the fridge without a cover on them to dry them out). Then add the eggs and such for a new flavor, shape the patties and fry away. De…licious! But I like your idea even better, they would cook faster and be much less messy on the hands. And we love sweet potatoes (this is the South; Florida specifically) so that is a nice touch to this recipe. Thanks! These look wonderful! I love that you use both russet and sweet potato in your recipe. My son doesn’t like sweet potatoes but I bet he would even notice! I personally would scarf up a whole plate full. My mom made potato pancakes with mashed potatoes. She added an egg, fried them up and served them with horseradish cream sauce. We gobbled those babies right up, horseradish and all! I never had potato pancakes before. I liked that you mixed russet potato and sweet potato together. These look totally delish. My family will love! Thanks for sharing. I haven’t ever made potato pancakes. I know it is a recipe my family would love to try. Thanks for sharing! 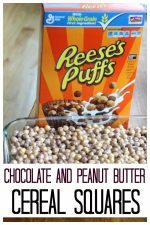 They really look delicious and I love the idea of adding some sweet potatoes in the mix. 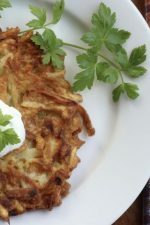 Growing up my grandma always made potato pancakes and so your post is making me nostalgic!